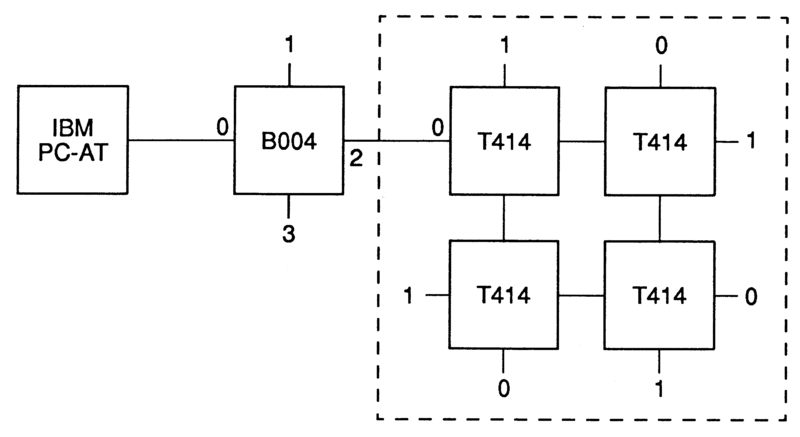 A transputer is a component computing device which can easily be connected to form networks in multiprocessor arrays. These arrays can become quite large and complex. This technical note describes an ’exploratory worm program’, which will explore an unknown network of transputers, and determine its configuration. This is useful in confirming that the transputers have been connected in a particular configuration, as required for some particular task, and that they are all working properly. Further applications include testing a network for reliability, and loading code into a network whose configuration is not known in advance. The exploration is achieved by having a program which will worm its way around the network, exploring all the links on all the transputers to determine the interconnections. 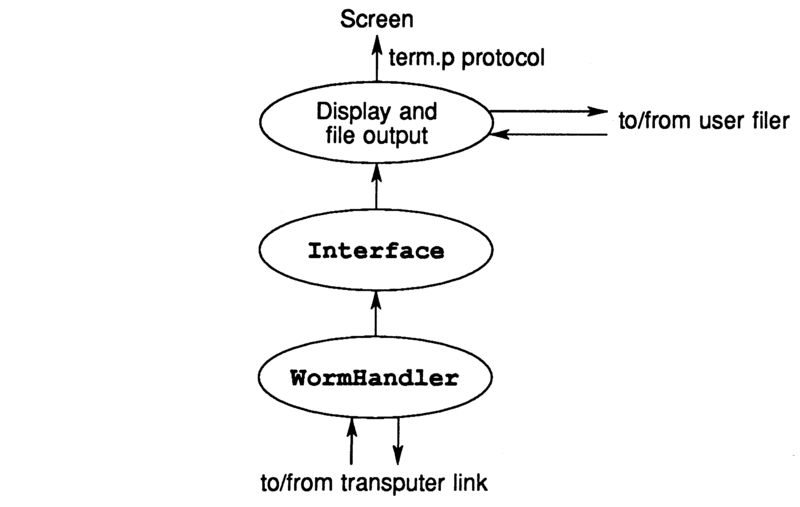 An example of an exploratory worm program, which is referred to in this technical note, is available as part of the Transputer Development System. This program explores a network made up of an unlimited number of IMS T414 transputers. Some notes about further applications are given in section 6. The transputer development system (TDS) recognises two different types of program, known as EXE and as PROGRAM. An EXE program runs on the host transputer, and may access the keyboard, screen, and filing system of the host machine. A PROGRAM, on the other hand, runs on a network of one or more transputers, and is loaded from the host transputer via a transputer link. This link may be the network’s only connection with the outside world. An example of such a system is given in figure 1. This shows an IBM PC-AT with an INMOS B004 evaluation board, running a single IMS T414 transputer and 2 megabytes of external ram. This transputer acts as the host processor for the development of programs, and for loading multiple transputer networks. Link 2 of the B004 is connected to an INMOS B003 evaluation board, which runs 4 IMS T414s, each with 256 kilobytes of memory. Typically, when a PROGRAM is loaded onto a multiple transputer network, a simple EXE program will also be run on the host transputer which monitors the output transmitted back from the PROGRAM, sends results to the screen, passes on any input from the keyboard, and controls the TDS filing system, as required. is to load and run the program on a transputer connected to link ToLink. The precise way in which a transputer loads code does not concern us here - it is described in full in . Suppose that a transputer is already running an exploratory worm program, and that it is connected to another transputer, which has not yet been loaded with code. The first transputer, which will be called the ’parent’, loads the second (’daughter’) by outputting the code Program as above. It then sends Program a second-time, which the daughter stores as a byte array in memory. The daughter is now also in a position to load other transputers, and so on, until the entire network is loaded. The Host EXE reads the CODE PROGRAM Worm fold, and stores it in a byte array Program. After resetting the network, it then loads this program onto the first transputer in the network by outputting Program on an appropriate link. As the worm proceeds to explore the network, the program running on the host transputer processes any data returned to it from the worm, interpreting and displaying the results. The following section (section 3) describes the EXE program which runs on the host transputer, while section 4 describes the PROGRAM which actually explores the network. Section 5 shows some typical results. Section 6 provides some notes on extending the exploratory worm for different uses. In describing the program, declarations and channel protocols have been left out, for brevity, except where they may not be obvious. Variable names start with a lower case letter, constants with a capital. Tokens, indicated by the suffix .t, are used to communicate a particular meaning on a channel, for example, NoMoreData.t. Similarly, a suffix .v is used to indicate a particular interpretation of a stored value, for example, assigning the value UnAttached.v to a word which describes the status of a link. It is assumed that each transputer can access enough memory to run the exploratory worm - information about the memory requirements may be obtained by creating a configuration information fold for the PROGRAM. After determining which of the host transputer’s links is to be explored, and resetting the subsystem network, the main section of the program is structured as in figure 2. The components are described in the following sections. The process code.fold.reader provided in the example exploratory worm program will attempt to read a CODE PROGRAM fold from inside a fold bundle, which may be a compiled or uncompiled PROGRAM fold, or a plain text fold. The latter option is included for reasons which are described in the section on filing the output. The reading and writing of folds and files is described in  an error occurs, the boolean errorFlag is set to TRUE, and the cause of the error is displayed on channel Screen, using the term.p protocol. 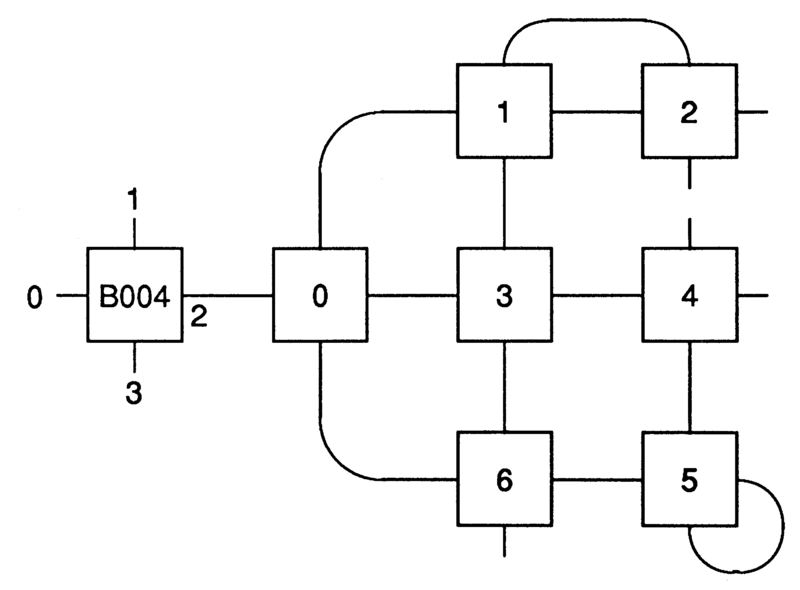 It is assumed that the reset pins of the subsystem network are chained together, and controlled by the host transputer (for example, the Subsystem Reset pin on a B004, as described in ). In order to reset the transputers correctly, the reset pin must be held high for a certain minimum period of time - a millisecond is ample. The program asks the user which link of the host transputer, linkNumber, is to be examined - the link which is connected to the subsystem must be stated. None of the other links will be tried during the course of the program. 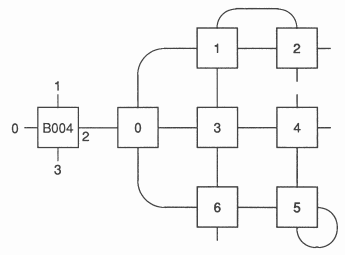 If two (or more) links are connected to the same subsystem, then only one can be tried. In this case, the other link will receive data from the subsystem, as the worm program explores, which remains unacknowledged. In order that this does not upset any program running on the host transputer after the exploratory worm has completed, all the links are reset on completion of the program. The resetting of links is described in . The channels LinkIn, LinkOut have been placed at the transputer’s hard links. 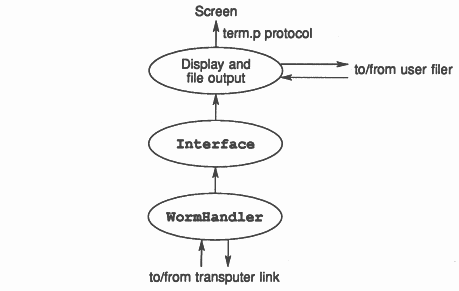 This process attempts to load a transputer connected to link linkNumber with the exploratory worm program. However, there may be nothing connected at all, or the transputer connected may not have been reset, or not powered on, or some other simple problem, in which case the output will fail. To cater for this eventuality, the OutputOrFail routines described in  are used. If the output of the code Program is not completed within a period Delay, then it is abandoned, and the link is reset. This makes it possible for the program to terminate neatly, even if there is no transputer connected to the link. If the code Program is successfully output from the link, booting a transputer, then PROC WormHandler sends more data, as described in section 4.3. In particular, this new transputer is given an identity number ’0’. As the exploration proceeds, PROC WormHandler relays data back from the network to PROC Interface. The Interface process is passed data from the worm handler. This is interpreted, and text is output on channel SoftScreen using the term.p protocol . write.endstream is used to close down these processes. If the program is run while pointing at a PROGRAM fold, results are displayed but not filed. As described in section 2, the exploratory worm program is constructed as a PROGRAM fold which consists of a separately compiled process, SC worm, placed on a single transputer. This is then extracted to produce a CODE PROGRAM Worm fold, which contains code to boot a transputer and run SC Worm on that transputer. This section now describes how that SC is constructed. When SC Worm starts to run on a transputer, it first identifies which link is connected to its parent, i.e. which of its neighbours booted it, and inputs a copy of the program code so that it, too, may boot other transputers. After initialising various flags (which keep track of which links have been explored, etc. ), the program now picks a link, and tries to send a probe down the link, which may (or may not) be connected to another transputer. An OutputOrFail routine is again used, and if the program does not receive any response, it will timeout and look elsewhere. The period of time for which program is prepared to wait, Delay, is quite critical. It must be long enough for any neighbour to have the chance to reply, but not so long that the program is slow to explore a large network of transputers. A Delay of 30 milliseconds has been found to be appropriate. Section 4.2 describes the way in which a transputer probes a link to test whether a neighbouring transputer is attached. Section 4.3 describes how, if this is successful, the program is loaded and run on the neighbour. These are incorporated into the exploration worm in section 4.4, which describes a simple algorithm for exploring a tree of transputers. 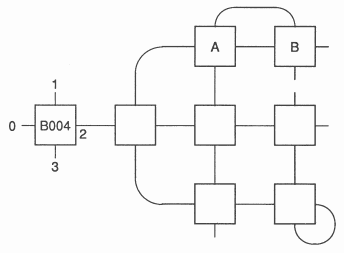 In section 4.5, this algorithm is generalised, to enable the exploration of a general network of transputers. Provided that the address specified exists in memory, then the word returned should match the data sent. A suitable address is MinInt, the minimum 32-bit integer, i.e. #80000000, the bottom of the neighbouring transputer’s internal ram. In practice, an OutputOrFail routine is used for peeking and poking, in case the link is unattached. If successful, the Data is returned on hard channel LinkIn[I]. Otherwise, (after a time Delay has elapsed,) the program assumes that the link is unattached. The parent sends the length of the program, which enables the daughter to determine which link is connected to the parent. The code Program is sent again, and stored by the daughter as a byte array for future use. The parent also sends a set of data which includes the parent identity number, the link attached to the daughter, and the number of transputers found so far, nTransputers. The daughter returns the data, with the link on which the daughter was booted appended. The data returned by the daughter is referred to as loadingData. loadingData contains information useful to follow the path of the worm. Its four elements are, in order, the identity number of the parent, the link which the parent used to boot the daughter, the identity number of the daughter, and the link on which the daughter was booted. This array is transmitted back to the host transputer for display. The WormHandler process, running on the host, acknowledges receipt of the loadingData with a Synchronise.t token, transmitted back to the new daughter. This section describes a simplified version of the exploration algorithm, suitable for exploring a tree, i.e. a network in which there are no closed loops. 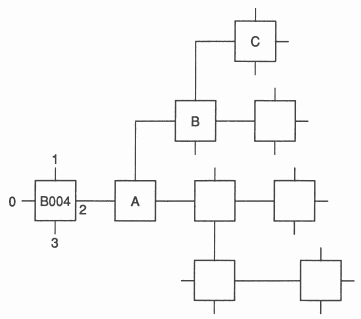 The complete algorithm is described in section 4.5. An example of a tree of transputers is shown in figure 3.
all links have been explored. Consider figure 3 as an example. Suppose that link 3 of transputer A has booted transputer B by link 0, and B has input a copy of the program from A. A enters stage 3, in which it will wait passively to transmit further data. Transputer B starts stage 1, probing one of its links to see if any other transputer is connected. Since link 0 is known to be connected to transputer A, link 1 is the first link to be probed. As described in section 4.1, the nucleus attempts to poke and then peek any transputer which may be attached to that link. The nucleus then waits for a word (which should be MinInt), to be returned on input link 0, for a period of time, Delay, before timing out. If nothing is returned, the program assumes this link is unattached, and sets a boolean downLoad to FALSE. The next link, link 2, is probed in a similar manner. However, let us assume that a transputer is attached to link 1, and that it has returned the value MinInt in response to the probing. Transputer B now attempts to load the neighbour with code (stage 2), as described in the previous section. Call this new daughter ’C’. C determines its parentLink, the code Program, and loadingData (stage 0). It takes its identity number to be nTransputers, and increments nTransputers by one, where nTransputers is the number of transputers found so far (the third element of loadingData). At this point, transputer B enters stage 3 of the program, and acts simply to pass on messages from C, even though it has not yet checked links 2 or 3. While transputer C explores its environment, B does not attempt to timeout link 1. Let us suppose that C is not connected to any other transputers. Having failed to find any neighbours, transputer C returns control to B, by sending the token ReturnControl.t, together with the latest number of transputers found so far. Transputer C then enters stage 4, and since it has tried all of its links, takes no further part in the exploration. B sets downLoad to TRUE, to note that a transputer has been loaded from this link. Because of the sequential nature of the algorithm, there is only ever one process actively testing its links. That transputer alone stores the correct value of nTransputers. This enables a unique identity number to be given to each transputer as the exploration proceeds. Note how the return of the value MinInt indicates that a successful poke and peek has taken place (the boolean badOut also indicates that this transputer has output the peek and poke). waiting is now set to true, and the algorithm enters the next loop. Although we know, from peeking and poking, that there is a transputer waiting to be booted off this link, it helps debugging to use the output or fail routines again here! The loadingData is returned to the host (for immediate display) and is acknowledged by the token Synchronise.t. On receipt of the data, the host process returns the token Synchronise.t. This synchronisation is important, for it guarantees that all transputers at stage 3 are ready to be probed on any link J, and are not still engaged in returning loadingData. The return of control indicates that the tree off link I has been completely explored. This process may now explore other links. Error reporting will be described in the next section. The searching procedure is initiated by PROC WormHandler booting the first transputer in the tree, and telling it that nTransputers = 0. When that transputer finally returns control to WormHandler, the total number of transputers in the network will be returned, and the network will have been completely searched. 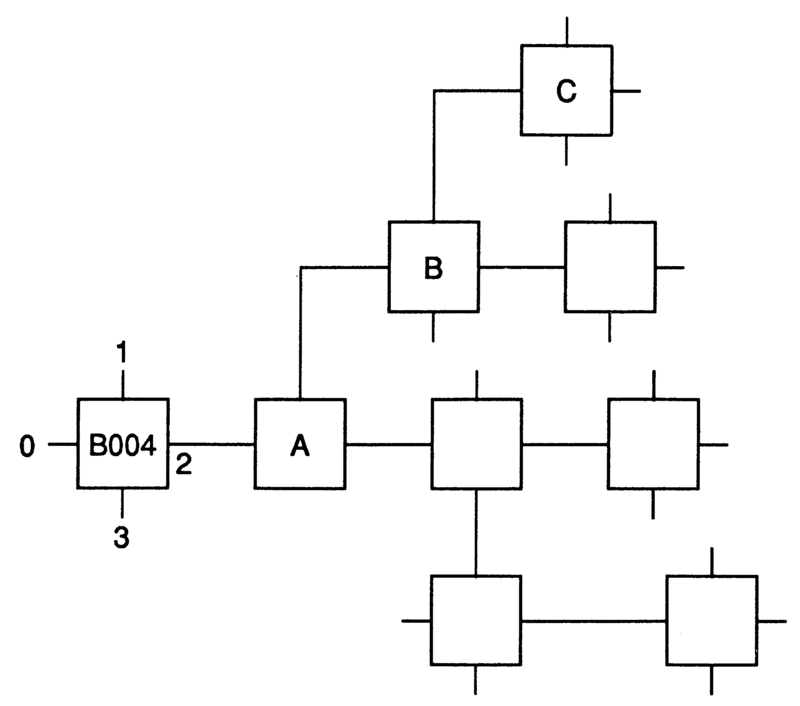 The algorithm described in the previous section would be quite satisfactory if all networks took the form of a tree. 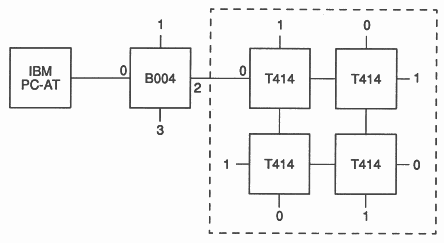 However, they are usually more complicated, in that they may have either or both (i) two links connected on the same transputer, and (ii) there are closed loops of connections involving more than one transputer. The network will still have a unique start point, however, namely the host transputer. An example is shown in figure 4. The basic algorithm is as before, but in addition there is the situation where a link is connected back to a transputer which has already been booted. This is handled by arranging for every transputer to ’listen’ on all links which have not yet been tried - using a replicated ALT construct. Suppose, for example, that link 2 of transputer A has booted transputer B on link 0, and is now passively waiting while B explores further. B outputs the poke and peek sequence on link 1, which arrives back at link 1 of transputer A. It must now be arranged that A will recognise this sequence, even though it comes in on a different link to the one on which daughter B was booted. So A inputs the whole message, and returns a token AlreadyLoaded.t, which has a value different from MinInt, in order to be recognised by B. In order that A does not try link 1 again later, a boolean tryLink[I] is maintained (initialised to true), indicating whether to try probing off link I. In our example, tryLink is set to FALSE. would be set to indicate that link 3 is connected to link 0 of transputer 6. When a parent boots a daughter, this information is communicated in the loadingData, and may be entered into the table as appropriate. However, when a transputer probes another one which is already loaded, the programs running on each transputer must exchange identities and link numbers, storing the information in linkArray. Initialise tryLink[I] to TRUE for all links except the link back to parent. The elements 0 and 1 of the array loadingData contain the identity and link of the parent transputer. If there is a closed loop (other than 2 links connected on the same transputer), we get the situation that one transputer probes another, which replies AlreadyLoaded.t. The two ends then exchange pleasantries, viz id and link. Make a note of the fact that a bad communication has taken place on this link by making a record in linkArray. Use a special token TokenError.v to indicate that an unexpected token has been returned. A classic cause of this is when two transputers are communicating at different link speeds (10 and 20 MHz, for example). A timeout at stage 1 implies that the link is unattached. However, if a timeout occurs at a later stage, assuming Delay is long enough to allow for the booting of a daughter, then the neighbour has not been successfully loaded - report this as an error. Pass on the identity and link array. There is no more data to transmit from this branch. This is an error. Return a modified linkArray report. Data from each transputer, giving the id. number and local link connections, will arrive back at WormHandler after the entire network has been loaded. The first table refers to the initial loading of the network. It indicates that link 2 of the host transputer (running on a B004, for example) has booted transputer 0 by link 0. Then link 1 of transputer 0 booted transputer 1 by link 0, and so on. The second table summarises the connectivity of the network, by stating what each link of each transputer is attached to. 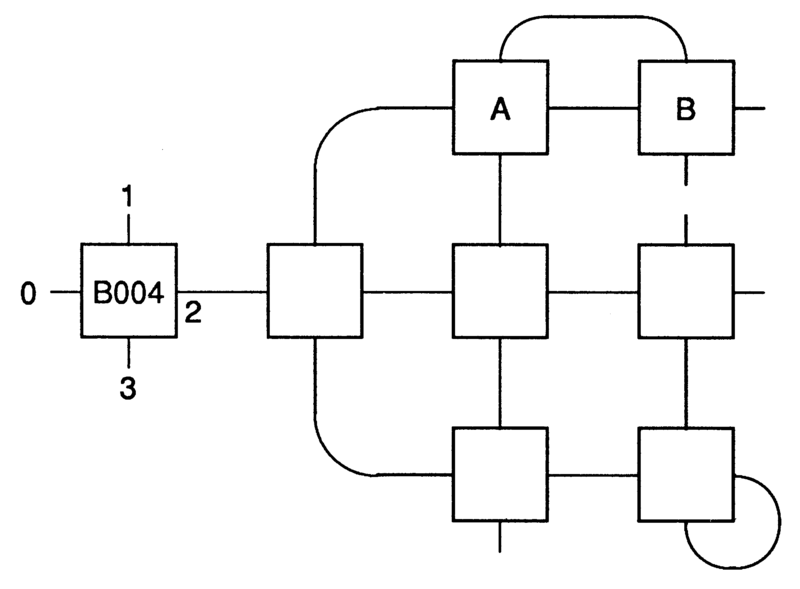 For example, the entry 6-0 in row 0, column 3, indicates that link 3 of transputer 0 is attached to link 0 of transputer 6. This section will note some further developments which can be made to an exploratory worm program, and restrictions on such a program. If data, for example text strings or constant definitions, is included in the program, then it will be ’word aligned’ in the compiled code. A program containing such data, and compiled for a 32-bit transputer (’T4’), will run on a 16-bit transputer (T2’), but the converse may not be true. Therefore, it will be assumed that programs intended to run on either a T2 or T4 are compiled using the T4 compiler. Communication between two transputers with different word lengths requires a mutually agreed datalength. For example, it might be arranged that all data is input and output as INT16 words, and that linkArray is built up and transmitted as an INT16 array. Internal communication of words should be treated similarly. For example, the input of a word, when compiled for a 32-bit machine, always attempts to input explicitly 4 bytes - which is not what is wanted if the program is to be run on a 16-bit machine. Beware that, if INT32 words are specified in a program which is compiled for a 32-bit transputer, they will be recognised as being of the natural wordlength of the machine, and no special treatment will be given. If the same code is run on a 16-bit machine without recompilation, the data would be treated as 16-bits, which would be catastrophic if it was intended to communicate a 32-bit word. (i) is a sequence for poking and peeking a 16-bit transputer, (ii) rounds this off to a valid 32-bit poke (but at an address in external memory, which is not guaranteed to exist) and (iii) is a sequence for poking and peeking a 32-bit transputer. Words have been expressed as bytes, little end first, to prevent any possible confusion over compiling 16 and 32-bit words. If the neighbour is already loaded, it should be made to reply immediately it receives probe (i). The same applies for boolean and INT16 arrays. Provided that it does not contain any floating point or extended arithmetic, a program compiled and extracted for a T414 will run on a T800. The reverse is not true - do not try to run a program compiled for the T800 on a T414. The code which loads a CODE PROGRAM fold onto a transputer is wordlength independent, and a program compiled and extracted to load a T4 will work equally well on a T2, provided that the above points have been noted. Because of differences in code placement, the debugger won’t work when the worm is running on a transputer other than the one it was compiled for. An exploratory worm program is an extremely useful vehicle for testing transputer based products. Tests for memory and the links may be included in the basic program, for example. If a hardware fault occurs, the program may report the location and nature of the problem, while continuing to test other components in the network. This is particularly useful during a long burn-in run. By testing the network repeatedly with an exploratory worm, any failure may be detected and logged, while the rest of the network continues to be burnt-in. The same program will be loaded onto every transputer. Ideally, all components of the network to be tested will be identical, but if there is any variation, the program will have to dynamically assess the attributes (for example memory size, peripherals) of each transputer it finds. The program has its own algorithm for assigning identity numbers to each transputer in the network, which may be quite different to the one which the user has in mind. If a failure occurs, and the program is run again, yet another different numbering of the network may occur. If memory is to be tested, a transputer should test a section of memory of a potential daughter using peek and poke, before booting that daughter. The section tested is the area where the program and workspace will go. If the links are to be tested, it should be remembered that corruption of data on a link (by noise, for example) might cause a data packet to look like an acknowledge, or vice-versa. The OutputOrFail -predefines are useful in this context. The program which the user wishes to run on every transputer is included as part of the SC Worm, so that it executes after the exploration phase has been completed. An identical program will run on each transputer in the network. This program will be passed information by the exploratory worm such as which links are connected to neighbours, and which is connected back to the parent. From such information, algorithms to control the broadcasting or routing of data may be developed. The host transputer will be responsible for communicating with the rest of the network as required, for example by sending out data for processing, and receiving results back. Although this technical note has described an exploratory worm as being initiated from the host transputer, there is no reason why it could not be launched out from an already partially loaded system. A more flexible system can be constructed by arranging that the worm declares a large workspace. After the system has been explored, the host sends out processes, in the form of pieces of compiled code, to specified processors in the network, which are run using KERNEL. RUN. This allows the placement of code to be decided at run-time, which might be useful, for example, in constructing a program which takes advantage of all the processors in an arbitrary network, or to be used as a basis for a multi-tasking operating system. By its very nature, a worm program is difficult to debug. While the INMOS software debugger is very useful for debugging a program which has been configured to match a known multiprocessor configuration, it does not deal with a program which has explored an unknown network. To make things simpler, let us assume that the program to be debugged is being run on a network of transputers whose configuration is actually known, and which is known to be free from hardware bugs. Since the worm takes the form of a PROGRAM configured for one transputer, a bug which occurs on the first transputer in the network can be traced by using the debugger in the normal way - simply point it at the worm PROGRAM and it will give the values of all variables, channel communication, etc., and the point at which the program failed. ... PLACE a AT 0, b AT 1, etc. ... PLACE e AT 0, a AT 4, i AT 1, etc. Load the network by pointing the EXE at the Worm PROGRAM configured for one transputer, in the usual way. (A suspected software bug occurs which causes the program to fail...) Now point the debugger at the copy of the program configured to match the network. The debugger will give complete symbolic information about the state of the system when the program crashed. It is always important that channels are declared and placed on hard links in the same way, no matter how the program is configured. This is to ensure that the way the code is loaded exactly matches the placement of the code for the configured program, as used by the debugger. If in doubt, use the ’check code’ feature of the debugger to check that placement of the code loaded on the transputer matches the configured program. After receiving a peek or poke sequence on a particular link, an unbooted transputer will continue to listen on all links for any further communication. Therefore, if two different transputers probe the same daughter, confusion may arise. In particular, it would be impossible to test the memory properly by peeking and poking. Once a transputer has been successfully booted, care must be taken in how it identifies its parent. For another transputer, besides the genuine parent, may also be trying to boot the new daughter. The numbering of each transputer with unique identity numbers can only take place after the entire network has been explored.